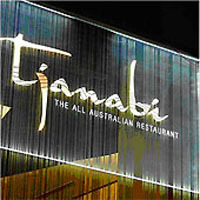 Tjanabi Restaurant has built an international reputation for the quality of its Australian game foods and native produce - featuring Kangaroo, emu, crocodile, wild boar and seafood. 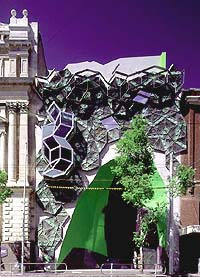 The team at Tjanabi has designed the menu to reflect the traditional six seasons of Melbourne. The traditional owners of the Melbourne area, the Boon wurrung and Woi wurrung divided the year into six seasons. Each season brought with it a new bounty of seasonal produce - and a new journey cycle. At Tjanabi - you will be able to enjoy the relaxed atmosphere and appreciate the fine art of one of Australia's leading Indigenous artists, Shane Pickett. 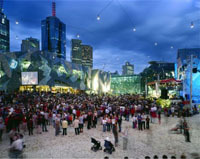 Immerse yourself in the rich creative culture that Melbourne is famous for, at Federation Square. With four unique galleries and museums you can explore Australia’s artistic and cultural history and help shape their future. See art in a completely new way at The Ian Potter Centre: NGV Australia; feel the thrill of Spring Racing at Champions and explore the frontiers of technology at the Australian Centre for the Moving Image. On any day and everyday at Fed Square there is so much to discover. The BMW Edge offers a unique audience experience. See a play, attend a launch, hear a speaker or listen to a recital, all against the dramatic backdrop of some of Melbourne's favourite icons. Through its glass 'skin' this modern amphitheatre enjoys views of the Yarra River, The Alexandra Gardens, Melbourne Cricket Ground and the Victorian Arts Centre spire. Located at the river end of The Atrium, BMW Edge has a seating capacity of 450 people. 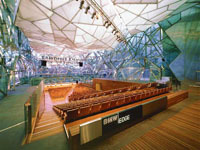 The striking contemporary fit out was made possible through the generous support of BMW Group Australia.